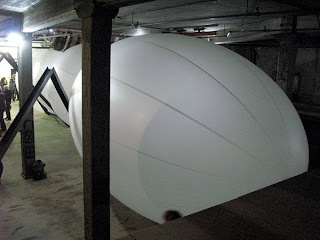 Subtwine – Entwine’s speakeasy-like downstairs space that has hosted musical-artists-in-residence such as Toucan (as profiled in the New York Times), video art exhibitions curated by CoWorkers Projects— for a limited time is home to the West Village’s only ongoing experimental sound art event, KINEMATIC Thursdays. Presented by Yulia Topchiy of CoWorker Projects, Kinematic Thursdays is curated by Helen Homan Wu of Opalnest. This is such a unique series of events blending video art, experimental music and sound art that I asked Helen for a bit of the backstory. A group exhibition featuring six young female artists from around the world, Bedtime Stories monotone dreams is showing at the artist collective space The Fardom from April 9th to May 2nd, 2010. The concept of the show was to manifest the moment that exists between sleep and wake states of mind. It was interpretted in all different ways by the artists and the works they chose to represent the idea. This is the latest curatorial project that I’ve been working on, and there is still one week left before the show closes. 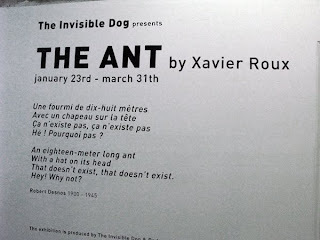 A few weeks ago, when I got an invite from Lucien Zayan, owner of the gallery The Invisible Dog to see an exhibition of a giant ant, I choked. 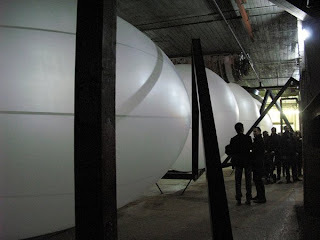 Then I watched a short animation of the giant ant housed inside the space and thought it was some sort of an advanced technology art project created by Europeans, because it’s so out-of-the-box. I didn’t bother read more about the show, prefering to keep it ambiguous, and persuaded a few friends to come along for a surprise at the opening on Saturday. 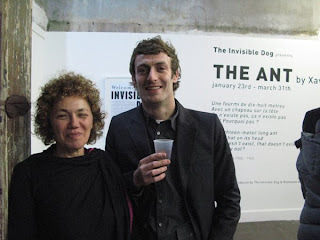 Outside the Invisible Dog it seemed like any normal quiet night, but stepping inside the huge space the atmosphere shifted. 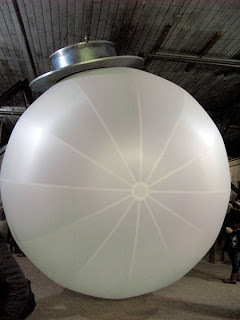 In front of me was a looming white ball with raw steel sticking out from all sides. 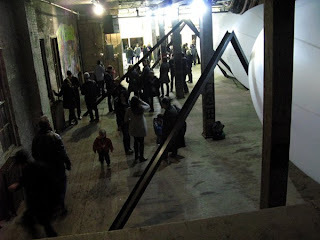 I was totally amazed at how bare they kept the gallery space to accomodate this giant. It seemed almost sad, but after reading the touching story behind it, I can see how it fits in to the theme. The ant was created to symbolize the trains transporting Jews and other nazi victims to concentration camps, and was inspired by the poet Robert Desnos. 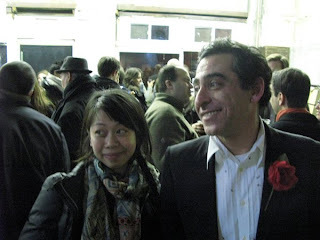 I didn’t get to meet the artist Xavier Roux, who conceptualized the project, but ran into Lucien with congratulating words. I liked the ant. I’m sure the children running around it enjoyed it even more. And the hat was a nice touch. My only wish is that they set the ant free when it gets warmer outside.